"Being visible, showing people in the community and other Latinos...that someone like them, talks like them, comes from the same neighborhood is doing what they dream of. I think that is the most ‘impactful' thing you can do," said actor Allen Maldonado ("Black-ish") at the National Hispanic Media Coalition (NHMC) Impact Awards Gala about his impact on the world. Allen ("Rosewood") is a former panelist for my Los Angeles "Uplifting Minds II" entertainment conference where he gave artists advice and even performed for the crowd because he is also a rapper. Today Maldonado has his own community event in downtown Watts in Los Angeles where he provides youth with advice and encouragement. 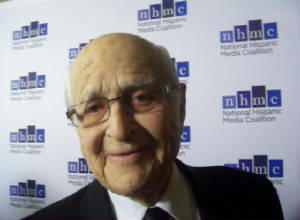 The NHMC 20th Impact Awards Gala was held at the Beverly Wilshire Hotel in Beverly Hills, California. It was to honor Latinos in media. The event was hosted by actress Christina Vidal (Training Day) and producer Lisa Vidal (Being Mary Jane). Some nominees included actress Karla Souza (Outstanding Performance in a Television Series); producer Catherine Tambini (Outstanding Documentary); executive producer Mike Royce (Outstanding Comedy Series); actress Justina Nachado (Outstanding Comedy Series); writer/producer Silvia Olivas (Outstanding Animated Series); creator Craig Gerber (Outstanding Animated Series); actor Jaime Camil (Outstanding Performance in a Television Series); actress Isabella Gomez ("One Day at a Time"), and actor Fernando Allende (Miami Vice). "The one I'm making at this moment," said Academy Award winning Executive Producer and Writer Norman Lear when I asked him which project was most close to his heart. "Because it is this moment....Everything came to this. ‘One Day at a Time' is the first Cuban/American family on television and their glorious." Norman, also a four-time Emmy winner, wrote and executive produced such ground breaking television series as "Good Times," "All in the Family," "Sanford & Son," "Maude," and "The Jeffersons." He was there to present an award to one of the nominees of his newest project "One Day at a Time." He also served his country in World War II and is a political activist that defends the 1st Amendment (freedom of speech, religion, press and government grievance) through his organization formed in 1981, People for the American Way. "I've been around for a while teaching acting and I've touched many hearts, an impact in many lives," said actress/producer Gloria C. Kellett ("One Day at a Time") on her impact on the world. "Who knows if they will grow up to be an actor...But the point is they will feel comfortable speaking in public." The Impact Awards Gala was sponsored by The Walt Disney Company, Univision Communications, Inc and Comcast NBCUniversal. NHMC is a media advocacy and civil rights organization for the advancement of Latinos. It works to ensure that media is fair and inclusive of Latinos and it seeks universal affordable open access to communications. 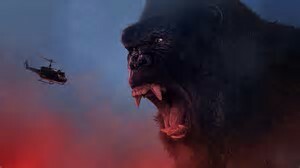 Warner Bros. Pictures' presentation of Kong: Skull Island is king and it arrives in 2D, 3D, IMAX 3D and at Dolby Cinema theaters March 10, 2017. It is part of the King Kong franchise by Marian C. Cooper and Edgar Wallace. This tale finds Kong defending the Islands' vulnerable inhibitors from the other gigantic monster size animals that live there, especially those that live under ground. Kong is the last of his kind and without his protection the non-talking community of inhibitors would parish. In comes the antagonist, an outside expedition lead by U.S. Army Lieutenant Colonel Preston Packard played by Samuel L. Jackson (The Legend of Tarzan) and financed by explorer William Randa played by Emmy Award winner John Goodman (Transformers: Age of Extinction). Randa, a senior official in the government, knows about Kong when he orders Packard to bomb certain areas of the Island, disguised as test maneuvers, which wakes up the giant Kong. What happens next fills the film with action and suspense. There is still the love story where Kong's gentle side is shown. In Kong: Skull Island that soft side was shown towards peace activist and photo-journalist Mason Weaver played by Academy Award winner Brie Larson (The Gambler). Kong comes to her aide several times while viciously defending his Island inhibitors from the helicopters full of bombs and American soldiers shooting at him. Kong is produced by Thomas Tull, Jen Jashni, Mary Parent and Alex Garcia. Dan Gilroy, Max Borenstein and Derek Connolly wrote the screenplay. The Legendary Pictures/Tencent Picture production is Rated PG-13. Directed by Jordan Vogt-Roberts Kong also stars MTV Movie Award winner Tom Hiddleton (War Horse) as Captain James Conrad the expedition's tracker a British Special Air Service Vietnam War veteran; Academy Award nominated John C. Reilly (Guardians of the Galaxy) as Marlow the World War II Lieutenant stranded on the island for 28 years; Jing Tian (The Great Wall) as civilian San Lin a biologist employed by the expedition company; Toby Kebbell (Fantastic Four) as Jack Chapman a U.S. Army Major - the right hand of Packard; Corey Hawkins ("24: Legacy") as civilian Houston Brooks the geologist also employed by the expedition; John Ortiz ("Blue Blood"), Jason Mitchell (Straight Outta Compton), Shea Wrigham ("True Detective"), Eugene Cordero, Thomas Mann (Beautiful Creatures), and Terry Notary as King Kong. Married with three children Harry has accumulated 10 Billboard #1 Jazz Albums. Learn more about Harry Connick, Jr. and his NBC Universal Domestic produced "Harry" show on Fox by logging onto www.HarryConnickJr.com, www.HarryTV.com and www.Fox.com/Harry-Connick. SYNDICATED COLUMN: Eunice Moseley, has an estimated weekly readership of over ¼ million with The Pulse of Entertainment. She is also a Public Relations Strategist and Business Management Consultant at Freelance Associates, and is Promotions Director (at-large) for The Baltimore Times. www.ThePulseofEntertainment.com. EVENT: 18th annual "Uplifting Minds II" Entertainment Conference (Baltimore Sat. April 22, 2017 and Los Angeles in October, 2017). This is a free event that offers an Entertainment Business panel and national talent showcase competition (vocal, songwriting, acting and dance) with over $13,000 in prizes. www.UpliftingMinds2.com.